It's got everything that a person could want -- except for the death by fat-cell asphyxiation. My brother works at Google, and I've eaten there, but didn't see this on the menu. 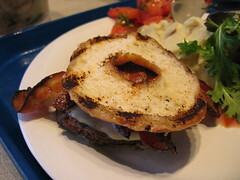 Comments on "The Bacon Krispy Kreme Burger- Or a Delicious Heart Attack on a Plate"